The mid-range smartphone market has been flooded with tons of choices; as well the same applies for the budget-friendly range. Though, there is always a room left for improvement, and a void to be filled. Such is this Zen Sonic 1 smartphone brought to you by an Indian mobile vendor. Promise to fill that void, the device from Zen Mobile offers 2GB of RAM and 16GB of internal storage, and that by far was the USP of the device until we started using this device more than a week ago. We unveil what is bad and what is good about this budget friendly device in the detailed review below. I wouldn’t exactly call this beautiful design, but it is not bad either in terms of the aesthetics of a smartphone. The body is full plastic, although, when holding a device in hand you won’t have feeling that it is a cheap device. You’ll see the capacitive button on the device instead of the on-screen buttons. The bottom edge only houses the primary microphone while the microUSB port is placed on the top edge alongside the 3.5mm headphone jack. There is not much appeal to the design of the device, except it has changed the usual place of volume rocker keys to the left edge while the power/lock button is on the right edge. Coming to the rear part of the device, it has a premiumish kind of look, but that feel goes as soon as you touch the device because you’ll see the smudges on it. The branding at the center looks good while the loudspeaker is placed at the bottom, and we liked the output of the speaker. Though, there was one design flaw that I didn’t like on the Sonic 1 is the protruding camera, and it is unjustifiable since this is not slim devices at 8.2mm thickness. Talking about the display, it is one of the flaws of the device that stops it from being one of the best budget smartphones. The screen is quite reflective as well even when you’re under the minimal light. The content is hardly readable under sunlight, even when the brightness levels of the display are set to high. Users looking to have at least a 720p display quality on their budget phones would not like the 480p quality on the Sonic 1. The capacitive touch response is one of the bad perks that you’ll get if you purchase this device. We don’t know what was the reason behind that, but the touch calibration on the display seemed little off whenever we used to swipe through the list or even during the usage of the keyboard. It would be real bad experience when you apply a screen guard over the device. 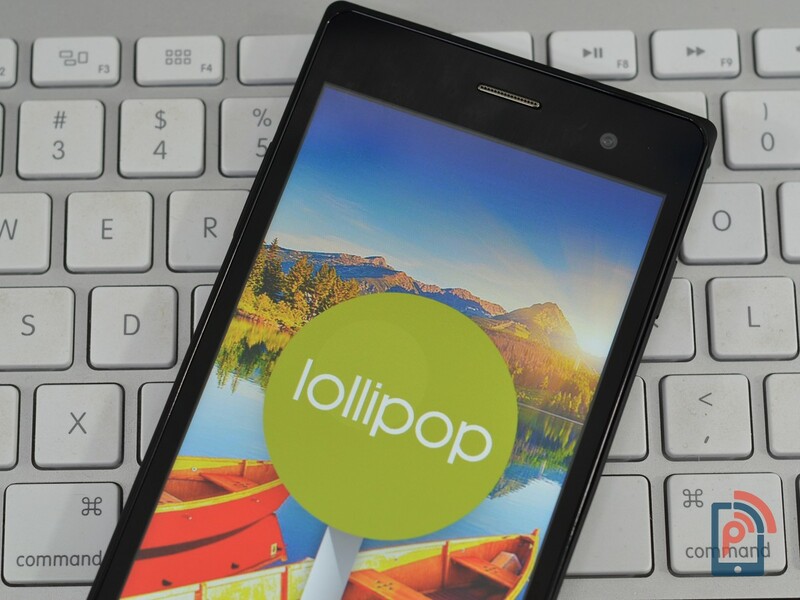 The Zen Sonic 1 runs on the Android Lollipop 5.0, and it is one of the cheapest Lollipop powered smartphones. Moreover, you get the pure stock Android UI on the device, which is a very big plus point. On most of the devices, these days you’ll find the custom UI that too with no app drawer, which is not a great experience when comes to organization of home screen. There are not many themes options available on the device, though; you can always go to Google Play Store. But you would find tons of Pre-installed apps on the device, while not many of them are useful in day to day usage, as the list includes apps like OLX, Quikr, Housing, Snapdeal and several games. Though, apps like ZenCare and Zen Store would be definitely helpful when you need and online support for your device. Other than that the experience of the interface on Zen Sonic 1 would be pretty much same as any other Android Lollipop powered device. The interesting point here is that the MediaTek chipset on the device doesn’t support the 64-bit architecture, and even though it offers good animation. The Overall interface experience is good, and you’ll feel at home, and would be familiar if you’ve ever tried out the Android Lollipop stock UI before. There is a 16GB internal storage on the device, although, only around 11GB would be available for users. Fortunately, you can always expand the storage via microSD card support. But remember the device doesn’t support OTG, and we plugged an OTG pen drive to test that too, the device didn’t detect it. Packing not a very powerful processor, MediaTek MT6582, you won’t feel that the performance is quick. Though, this is the same processor that you’ll see in most of the budget, as well as on mid-range smartphones like Oppo Neo 5 and Gionee Pioneer P6. We have used both the devices, and despite sporting same chipset, they had performed not well when we compare it with Sonic 1. It would be mostly because of the stock Android OS while those two sport the customized UI of their own. Talking about the gameplay on the device, it was quite satisfiable experience on the Riptide GP2 and Dead Trigger 2. These are not many heavy graphics games, but when it comes to graphics, the GPU and display is to blame rather than the chipset. Though, fortunately, we didn’t face any issues that are worth mentioning here and running the reputation of the device. But we don’t recommend that you play games in high quality mode since the screen is WVGA, you will only end up displeasing your gameplay experience on the Sonic 1. 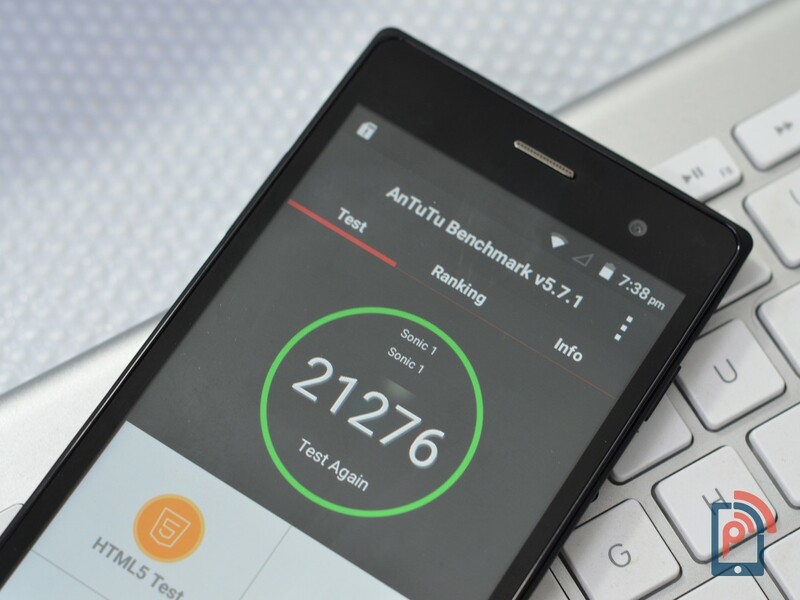 The benchmark scores of the device were unexpectedly higher than its competition with the same chipset. 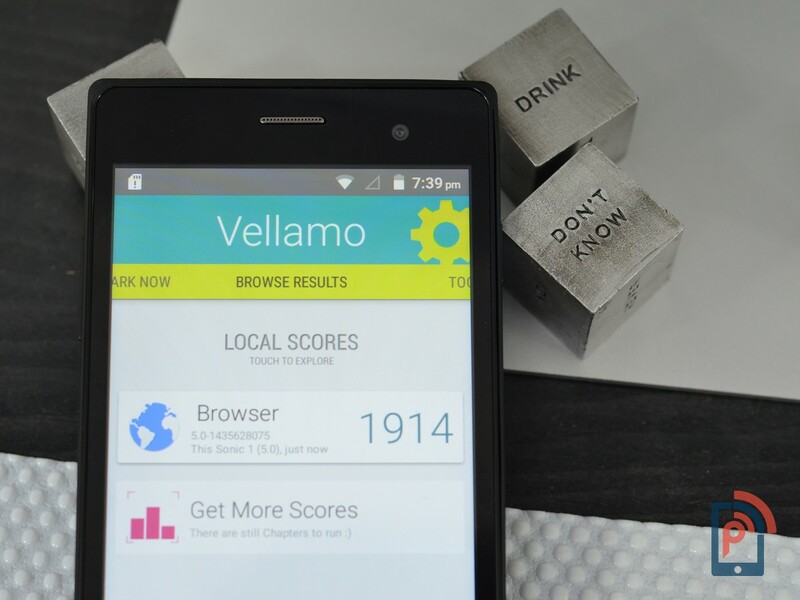 For Antutu, Sonic 1 scored 21276 and for a browsing test on Vellamo it saw count to 1914. The coupling of 2GB RAM and 16GB internal storage also helped to increase those numbers from the average joes. The available RAM, most of the time on the Sonic 1, was more than 1GB, which is quite an interesting number, as can multi-task and switch apps without worrying about RAM usage. There were no heating issues as far as the gaming and Skype calling are concerned, though, while using the camera for more than half hour, we noticed that the rear module was heated quite a bit. But it cools down in seconds as soon as you close the camera app. Though, the camera on the device isn’t great, so I don’t think so you would be using the camera on this device much more than few minutes. We did the browsing test on the device, and it was not a pleasant experience, as the touch response is not up to the mark. Moreover, the pinch to zoom doesn’t really work when needed. While the site loads pretty smooth on the device, but the touch response is not quick, and we were dissatisfied with that. These days even the budget-friendly devices are coming up with the good megapixel count, although, the Sonic 1 lacks here as it packs 5MP rear camera with LED flash. But considering the capture quality, you can manage to get better than average results even on the 5MP module of this Zen device. The color reproduction was fine, and we cannot consider it to be a good camera phone at any point. But if you aren’t looking to take too many captures then it is a device that you can unhesitantly go with. Talking about the camera app, it is pretty much the stock app that you see on the Android Lollipop devices. You can access the camera app directly from the lock screen, just swipe up from holding the camera icon. There are no filter effects available on the app, though. But you get other modes like Face Beauty mode, Live Photo mode, as well as the panorama mode. Moreover, you also get features like inbuilt time lapse, EIS, and manual mode. The overall UI is clean: there is a shutter button, gallery access, as well as video button. The more useful were the HDR and the Flashlight features on the device, as the output comes more detailed when you use those features wisely. While the front facing camera on the Sonic 1 is of an average quality, but again that Face Beauty mode comes in handy, as it beautifies your selfies. Further to judge the output of the 5MP rear camera you can check out the captures posted here. The battery on Sonic 1 is not the best among its budget range, although the capacity of the battery is on par with other handsets in the same range. But still the 2000mAh capacity does not offer great screen on time as well as the standby time. As whenever the device was kept in idle state, the battery went down to more than 20%, which is never a good sign for the battery life of the device. Moreover, the device takes quite a time for charging considering the low capacity of the device. The fact that the device packs WVGA display is a much relief to the users in terms of battery usage, as the lower resolution display would use low power. The budget-friendly devices generally would be packing the basic set of connectivity features, and that is the case with Zen Sonic 1. Since, the device doesn’t pack a processor that can support the 4G LTE on the device. So, it’s a no for 4G services, but you get good 3G connectivity as the signal strength most of the time was pretty good. Other connectivity options that work perfectly on the device includes the Wi-Fi, Wi-Fi Hotspot, Bluetooth and the GPS. We had no issues on this device regarding call quality or any other type of connectivity. Budget range is filled with many choices, and one cannot think over enough while purchasing a device in the Indian market. The Zen Sonic 1 may not tick mark all the choices that you would like to be present on your Ideal budget friendly smartphone. But it is as best as it gets in terms of the RAM performance and internal storage space, because even in a world of affordable smartphones, it is hard to find a combo featuring 2GB RAM and 16GB internal storage devices. Though, there are users who would like to get at least a good camera and battery life out of the budget phone that they’ve spent their money on. There are other devices that offer those features better than Zen Sonic 1 including the like of Xiaomi Redmi 2, Yu Yuphoria and Lenovo A6000 Plus. While Xiaomi has reduce the price of Redmi 2 to Rs 5,999, making it a tough competitor against the Sonic 1, but if you want to buy the Yuphoria or A6000 Plus, then you’ll have to shell out more bucks. And it would only make sense to go for one of those devices if you’re going to need much better camera than on the Sonic 1.